PEARL HARBOR - Commander of U.S. Pacific Fleet Adm. Scott Swift held an all-hands call with the crews of the Sterett-Dewey Surface Action Group (SAG), comprised of the guided-missile destroyers USS Sterett (DDG 104) and USS Dewey (DDG 105) April 12, on Joint Base Pearl Harbor-Hickam. During the all-hands call on the Sterett's foc'sle, Swift addressed the members of the SAG which included members of the command staff of Destroyer Squadron (DESRON) 31, Sterett and Dewey crews, and members of embarked helicopter detachments from Helicopter Maritime Strike Squadron (HSM) 49 and HSM 78. 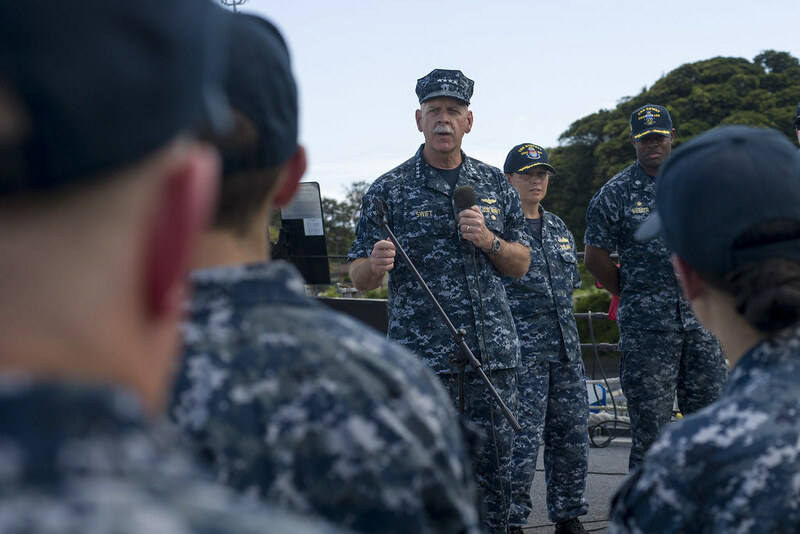 He welcomed them to "the leading edge" of the Pacific Fleet and emphasizing the importance of the tasks ahead. "This is an example of our strength and resolve to be wherever we need naval forces," Swift said, citing the Carl Vinson Carrier Strike Group schedule change to the Western Pacific. "What you're doing is truly history-making. Hopefully, one day these deployments will be the norm, but we're not there yet - we're still experimenting and learning." The Sterett-Dewey SAG is the second surface action group to deploy under "3rd Fleet Forward." Under the operational control of U.S. 3rd Fleet, the Sterett-Dewey SAG will work with regional naval services to conduct routine patrols, maritime security operations and theater security cooperation activities to enhance regional security and stability in the Western Pacific. U.S. 3rd Fleet operating forward offers Swift additional options by leveraging the capabilities of both the 3rd and 7th Fleets. This deployment, Swift emphasized, is about "...reminding allies, partners and friends of our longstanding commitments to the region and about deterring aggression and coercion. It's about setting the standard and setting the example and expectations from a global perspective, an international perspective, about how we conduct ourselves on the sea." Following his remarks, Swift took questions on a variety of topics, ranging from the future of the Raytheon SeaRAM anti-ship missile defense system to increased Russian military activity. Chief Electronics Technician James Smith, a Baltimore native and CE division leading chief petty officer aboard Dewey, said he appreciated hearing Swift's thoughts on the work the Sterett-Dewey SAG Sailors will be undertaking. "I think it's great for the Sailors to put a face to the name. We all read the things he says, but it was beneficial for him to actually come out and talk to us to give the chance for us to ask questions we may not have even thought of before," Smith said. "He didn't skirt around anything, and I think there's a better understanding of why we're going on deployment." Fire Controlman 2nd Class Scott Rogers, a Lawrenceville, Georgia native assigned to Sterett's gunnery division, said he was impressed with the way Swift communicated with the crews. "It was great how (Swift) reinforced why we're going to do what we're going to do, the impact that's going to have on the big picture tactically, and what we're going to do long-term. It gave us an idea what the Navy's projection is in the short term, as well as for the future of the surface action group," Rogers explained. U.S. 3rd Fleet leads naval forces in the Pacific and provides the realistic, relevant training necessary for an effective global Navy, constantly coordinating with U.S. 7th Fleet to plan and execute missions based on their complementary strengths to promote ongoing peace, security, and stability throughout the Pacific theater of operations.